Accused: Chandreshekar Jadhav is arrested by Malad Police Station on 10/01/2018 in the afternoon for physically assaulting couple. On 10/01/2018, Salim Charania (private detective) received a call from Mr. Bhavin Bhatt & Lawrence Sequeira that the couple named Mr. Zairom and his wife are the animal care taker in the chawl area of malad and they were physically and verbally assaulted by 2 people in their area, Mr. Bhavin and Mr. Sequeira wanted Salim to investigate & file a case against the people involved in the assault. 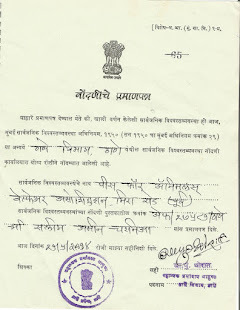 Professional fees is been paid by Mr. Sequiera to Salim Charania to handle the case. So on 10/01/2018, Salim called the couple to the Malad police station in the afternoon and heard them. On 09/01/2018 late night, Mr. Zairom wife went to Chandrasekhar house to ask him about the kitten which he had hide inside his house, he had tied a rope to the kitten and confined him in to small area, the kitten belongs to couple, when she asked him to return the kitten to her back again, he verbally abused her by giving bad words, upon seeing the verbal assault, Mr. Zairom came to rescue her, Zairom took the kitten back and asked his wife to head towards home and finish the issue, as he got the kitten back. Chandrasekhar and his friend attacked Mr. Zairom physically resulting in serious injury to the finger. The couple tried 100 (control room number) 12 times to police, but the couple did not got any help. Salim observed that the Zairom finger is in a bad state, so he immediately took him to Sidharth hospital in Goregoan and got him treated with necessary medical help, The assault on him was too brutal, that his finger is dislocated, Salim spoke to the Doctors and obtain necessary evidence with X ray and medical Certificate to file a case. He put the whole incident in front of lady duty police officer and requested her to get the accused and file case immediately. Police team were sent to accused house and the Fir is registered under IPC 324, IPC 323, IPC 509, IPC 34. Chandrasekhar got arrested and his friend is absconding who is involved in the assault, he will be also arrested soon upon police investigation. The matter was too simple, if Chandrasekhar would have voluntarily given the kitten back to her without assaulting her and her husband, the accused present himself as a goon in the chawl area, and to just show people that how big goon he is in the area, he assaulted weak people. His attitude in the police station was very pleasing and soft, because he is a weak man in front of law. The accused tried to speak & convince Salim to let go off the case but Salim did not hear him and went ahead with the legal action.